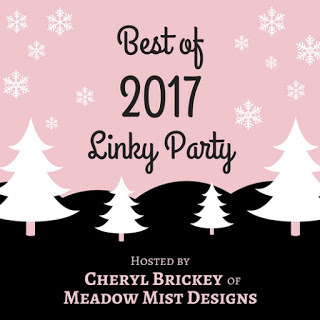 Each year, during the last week of the year, Cheryl of Meadow Mist Designs hosts a party where you look back over your posts and choose the best five of the year. You choose them however you want. May I just take this opportunity to say, this button rocks, Cheryl; I love it! I'm not one to look at my stats more than a couple of times a year. So I was rather surprised when I looked now to see how many posts I've written so far this year, and I see that many got well over 1000 views! That is pretty amazing when I realize that just a little over 4 years ago I was regularly getting a number of views I could count on one hand. 😇 I've written or am about to publish 130 posts this year, probably a few more because of my DREAMi and Sunday Stretch posts this coming Saturday and Sunday and maybe another finish. I am very proud of running my first Quilt Along and of how well it was received. There are several posts that go with the QAL, but this post will take you to the finish. Click the Freefall tab up top and you will find all the posts. I am hopefully going to get the posts all into one PDF pattern for sale very soon, dare I hope for by the end of the year? 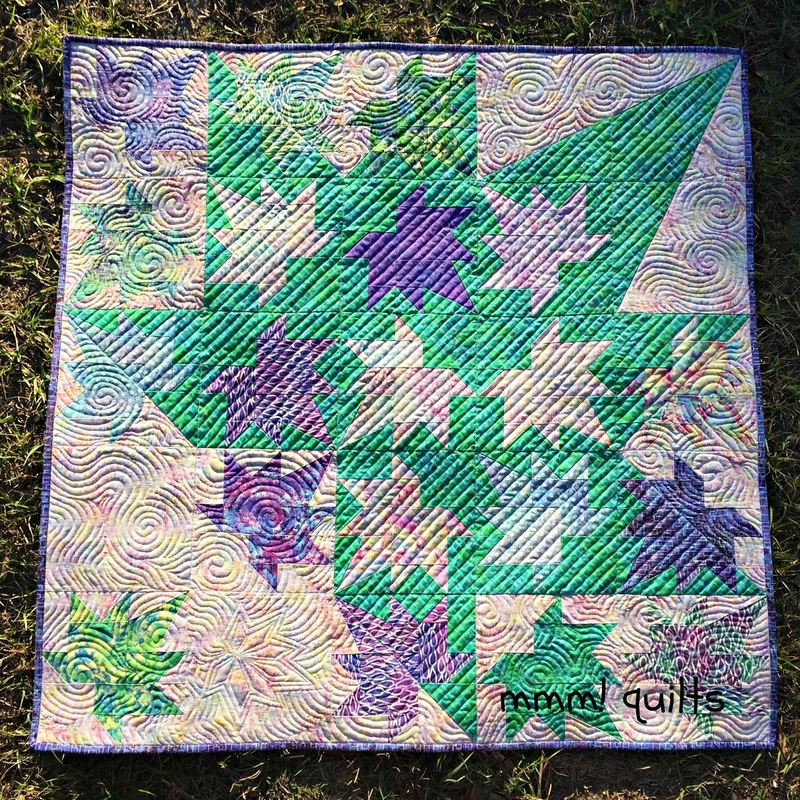 Twelve people linked up their tops or finished quilts, and later I heard from a few more who sent me photos of their quilts after the QAL, something which warms my heart so very much. I had participants from (off the top of my head) five different countries! The most-viewed post was my rendition of Quilter's Laundry Day. 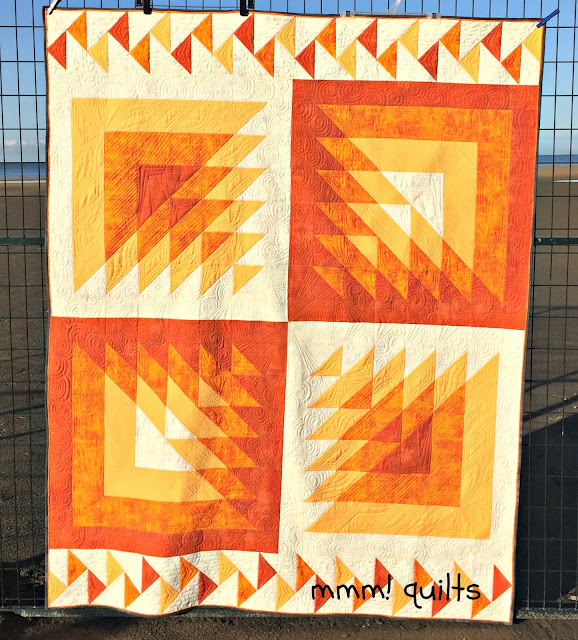 A very proud mama moment for me this past year is the post announcing my first ever publication, in the ezine, Modern By the Yard, put out by Benartex Fabrics. Coins of the Atocha (a name suggested by my good friend Julie, of Pink Doxies, for the gold coins found in the shipwrecked Spanish galleon off the Florida Keys) was in the Spring edition of the ezine. The quilt is named On the Plus Side, in the magazine, a name that I quite like too! One of my favourite makes in 2017 is Radiance. This one, like Coins of the Atocha, is not in my regular comfort zone of colours on the wheel. However, I think I nailed it on the progression, and the quilt seems to glow, pulse and radiate. The photo shoot is a memory I will always cherish, for it led to the rediscovery of this incredible beach less than 10 minutes' drive from my house. The early morning light was just perfect to show off this baby which lives in my nephew Aidan's home where it is very much cherished. He messaged me on Christmas Day, and talk of the quilt came up without prompting. My heart glowed like the quilt. My number 5 is all the I Like/Love posts I wrote in 2017, with one more to go for Thursday. I used to do a Thankful Thursday a couple of years ago, but I like that there is now a linkup for those of us who write these. These posts, my own, and reading others', have helped my spirit in a year that has been extremely difficult: heart-wrenching, and soul-searching. Finding pleasure in and gratitude for life's simple treasures has helped me get through this year with a move that caused more angst than I got into here, the tragic death of our son-in-law, Brady's beloved dad, far too young, and just 2 1/2 weeks ago, the loss of our beloved gladiator, mama bear, Naala, who fought so hard and seemed to be a poster child for a splenectomy survivor. LeeAnna of Not Afraid of Color started these after the death of her beautiful standard poodle, Cole, and I am so thankful for the community of 'I Likers/Lovers' who I've got to know, some of whom I already did, but new friends too. 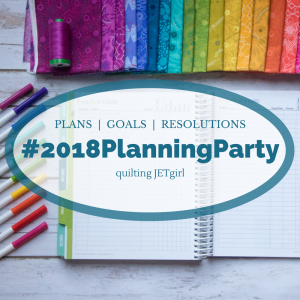 Once again, I am joining in with Yvonne at Quilt JET girl for her 2018 Planning Party. I got used to doing this throughout my teaching career; it can be a bit of a 'ugh, do I have to?' feeling, but it is so very worthwhile, and something I firmly believe in, like physical exercise! Reflections Part 2: How did I do in 2017? My over-arching goals were Lifelong Learning and Balance, and I am keeping them for this next year. Wow, I did go on quite a learning curve this past year! I am happy to report that I attained better balance, although I still take far too long to write a post, this one no exception, groan! I finished three quilts for family members, C' Boss! Cows quilt, Radiance and Forever Flowers and made a lap quilt for Brady, using his own design. 🚩set up a linky party, which happened in January, called DREAMi! -- Drop Everything And Make it and has run each month all year. Here is the intro post. Note it's morphed into DREAMi! because everyone seems to write it that way, even though I had a small 'r' because it is part of Drop. No worries; I'm flexible. 🔕not done is a quilt along organized by myself and Tish of Tish's Adventures in Wonderland. 🚩 Made and donated 3 charity quilts, with a couple of cat mats in the works yet. I'd aimed for 2, so I'm very pleased. I also made blocks for a few different needs over the course of the year. 🚩add at least two patterns to my Craftsy shop - done! (affiliate link) Three were added, all free, Freefall has come down and will go back up for sale, with 2 sizes, and the cushion. 🚩submit an original design to a magazine - done! Three of my designs have been accepted, two published with a third upcoming shortly. 🔕quilts for sale in local coffee shop; quilt a quilt for someone else; more involvement with Craftsy, none of the above happened although I did make some headway in all three. 🔕 improve aesthetics of my blog and investigate branding --bzzz. other than clean up the sidebar and tabs a tad. 🔕 make a quilt entirely of solids - started The Honey Pot Bee, fell by the wayside after the first 3 months. 🚩do a design challenge. Done, with the lovely Lisa of Sunlight in Winter Quilts, and it was a great success; I even had Melody of The Red Hen Shop approach me to be a sponsor, and she was terrific! It's just what I do. I've always been committed to this; I take on new things that may scare me a bit, but I put one foot in front of the other, and always learn and always grow. Another thing that in retirement from teaching school seems ludicrous to even discuss, but my retirement is anything but boring! I do teach part-time still: yoga. 🙏 Each day is full, but I want to be sure I am not feeling beholden to the blog. I need to say no, even if it pains me to do so. I still want this blog to be primarily a giver of joy to me, and to others. 1. Maintain and continue to expand the purpose of my blog. there are a couple of imminent plans collaboring with/being a part of sections of QBL that I can't talk about just yet, which both excites and scares me. add items to my Etsy shop, small ones like bags and runners. add to my Craftsy store. I can add Coins, Let Your Star Shine now that the window has passed. Freefall/Windfall needs to be added. 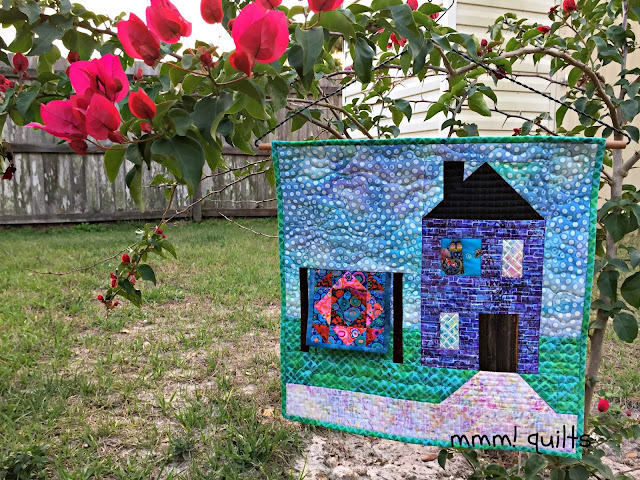 run another Spring/second quarter QAL. The pattern is another shadow quilt! pursue the branding of my blog, and get business cards printed. Physical exercise is so important to me, so I plan to continue with walking, aiming for 15 km/week. Continuing to aim to practise Ashtanga yoga three times per week, is important. I've gotten much better at doing one practice at home this year, though there is still room for improvement there! Doing Yin twice a week has been achieved overall. Work out twice at the club where I teach; this goal has been started by working for a few sessions with a personal trainer. Continue to write one Gratitude post to link up with LeeAnna. Watching more TV: I'm on season 2 of Gilmore Girls, (binge-watching just isn't in my wheelhouse); I have one more episode in season 5 of Once Upon a Time; I haven't started season 2 of The Crown yet; I'm in the middle of Outlander; we are nearly up to date with Still Standing; I am almost finished season 4 of Call the Midwife. Not very good. I want to get into Doc Martin, work my way through some more Murdoch Mysteries, and I'm really looking forward to Last Tango In Halifax season 3. I need to watch more movies! I saw 'Hidden Figures' - SO SO good. Reading: Again I want to read at least 25 books. I've read a fair amount of non-fiction this year, but I like a balance between fiction and non-fiction. Knitting: more! Make that dratted lace scarf; a slouch toque for Brady (have the yarn); hope to finish the selvages rug (it's about half way), and make myself some fingerless gloves (have the yarn). Prep that Lazy Daisy wool appliqué quilt so I can big stitch quilt it. Those quilts are beautiful! I can see why you're proud of all of them. OMG, your goals! You're far more organized than I am. I need to start thinking about what I want to accomplish next year! What a beautiful recap and I'm already excited to learn more about your 2018 plans when you can share. 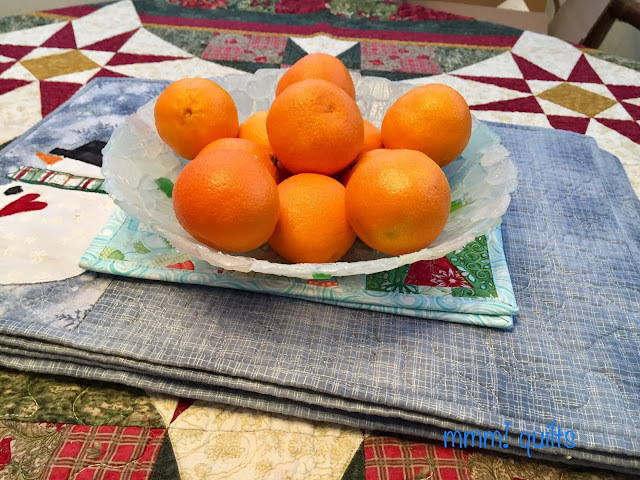 Thank you so much for linking up and may you have a peaceful 2018 with lots of quilting joy. You are on fire Sandra with so much you have accomplished and will continue to accomplish into the next year. All I can say is WOW to all of your accomplishments and goals. I'm so glad to have met you through blogging this year and participating in Freefall. We definitely shared some funny moments, misreading your post and thinking you were a former bronco rider still makes me laugh. I'm looking forward to reading more of your adventures in 2018 and participating in your Spring Quilt Along. Happy New Year! I thoroughly enjoyed reading your recap and goals. May 2018 be a year of more outstanding quilting and may you reach your goals. How do you do it woman? Every post you write, reaches out to me in so many ways..you are amazing. You give so much of your time to others in so many ways and we love you for doing so many things with us. I am nowhere near your level of time management skills and this is something I shall be working on in 2018. I said this when I retired two years ago and am still nowhere near where I want to be. Congrats on all the success with your 2017 goals and ambitions. It seems you've done pretty well with all the balance stuff, even when the events of this year were the kind that throw most people off stride. Looking forward to seeing all your plans and projects in 2018. Wishing you a very successful and joyful New Year. Great recap of the year and congrats on such a successful QAL! Thanks for linking up and I hope you have a wonderful new year! So much you have done this year AND you teach yoga, do all the walking and exercise, and still find time to read all those books, I'm amazed and impressed, you have certainly raised the bar. Congratulations on all your wonderful accomplishments, and I wish you an equally wonderfully successful 2018. I will never tire of seeing Radiance. ♥ You did well with your 2017 goals. Looking forward to seeing your 2018 goals unfold.